I finally finished a new pair of 2-way bookshelf speakers for my home theater, a project that started over two years ago. 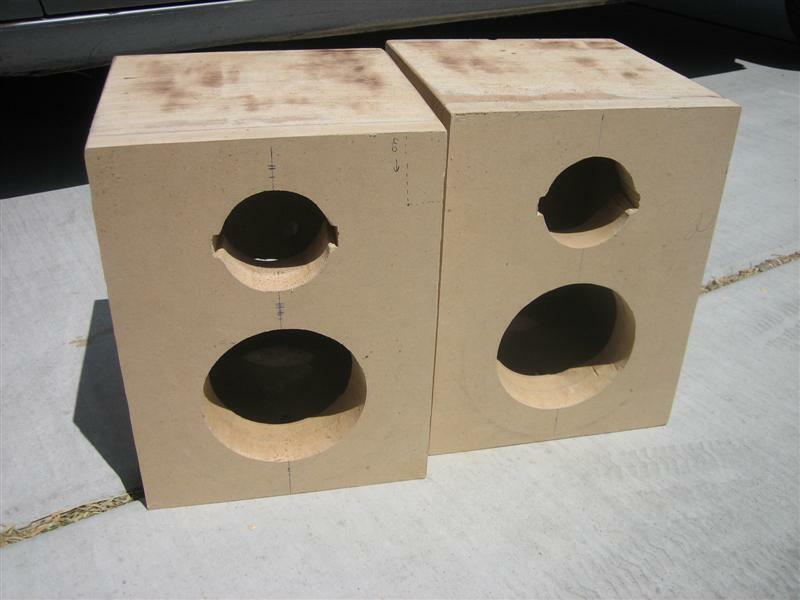 It was back in March of 2006 that I bought a pair of Dayton RS-150S-8 6″ Reference Series woofers and RS-28A-4 tweeters. 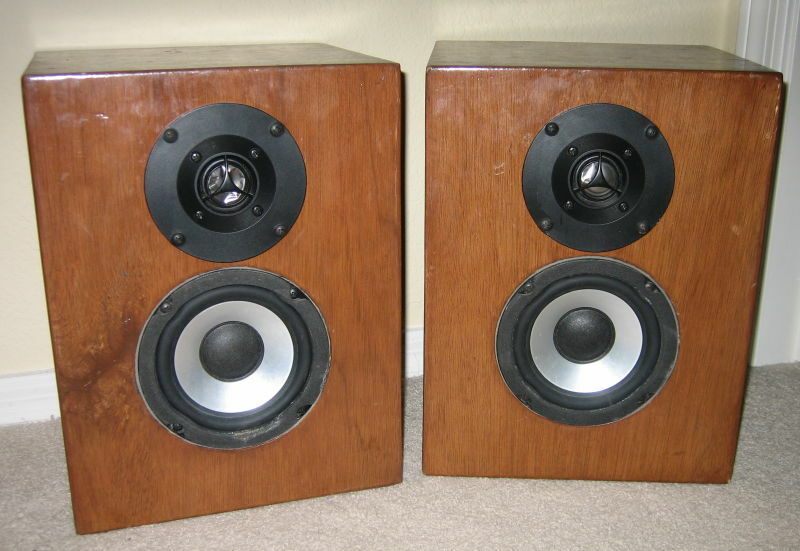 The plan was to refinish an old pair of speakers that had some old MCM speakers in them that weren’t worth the time I spent on the nice enclosures that housed them. They never sounded very good, and the tweeters somehow got completely destroyed, in spite of the plastic shield that was suppose to protect them. 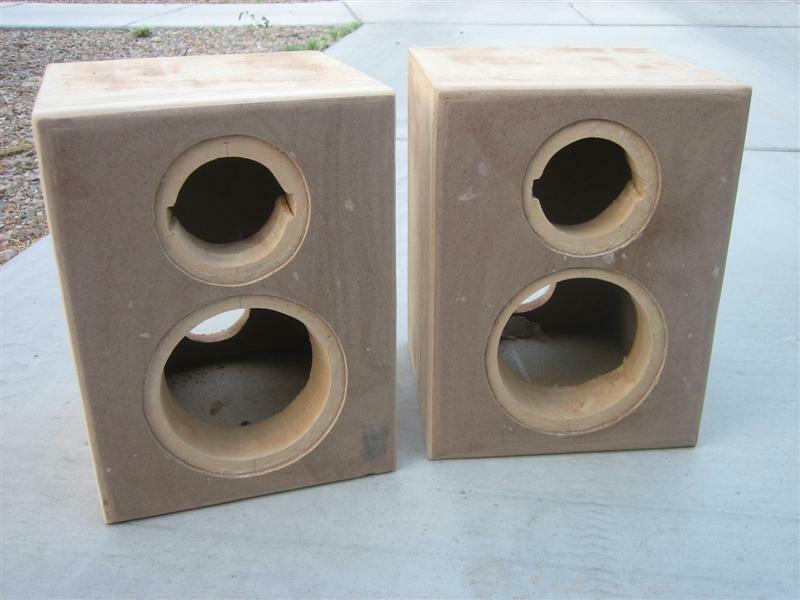 So I picked the new speakers to drop in to the old cabinets in hopes of doing it with little modifications. Then the summer passed and I never got to them, winter came and went, then last summer came and went and the speakers still sat in their original boxes. I at least had plenty of time to stew over the crossover, which I would do from time to time, tweaking and modifying each value until I finally came up with something that looked really good and used a minimal amount of components. After settling on a crossover design and having the boxes pretty much complete and getting ready to make this speaker happen, wouldn’t you know that Parts Express showcased a brand new two-way speaker in their projects section designed by none other than speaker guru Darren Kuzma, which used the exact two drivers I had sitting on my shelf. And they called it Encore. 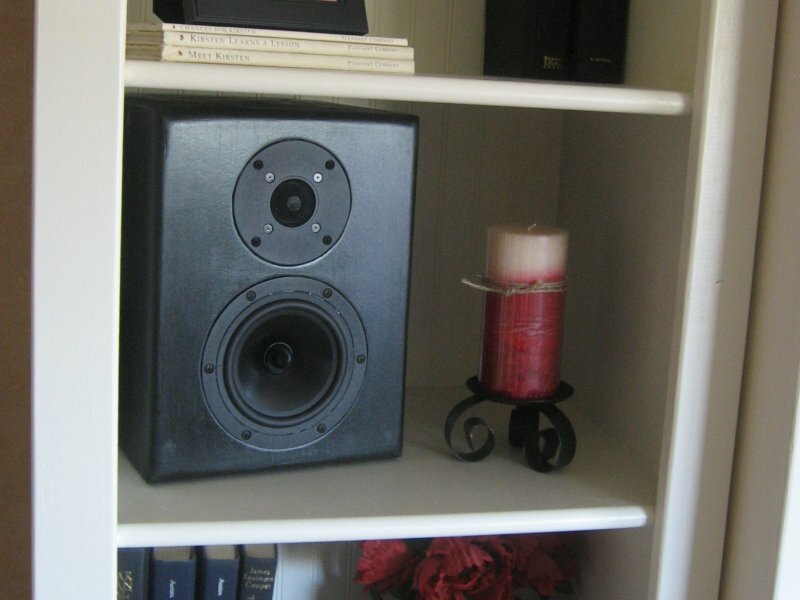 I read through his whole design and was happy to read that he was very pleased with how the speakers sounded. I compared my crossover design to his and modeled both using PCD and compared the two plots. The FR plots looked nothing alike, not surprising since the designs were very different. I don’t claim to be a great crossover designer by any means, I just don’t have some of the better tools and software to model them up properly, so it’s a lot of trial and error for me. I considered buying the parts for his crossover and mine and comparing them to see which one I liked better. 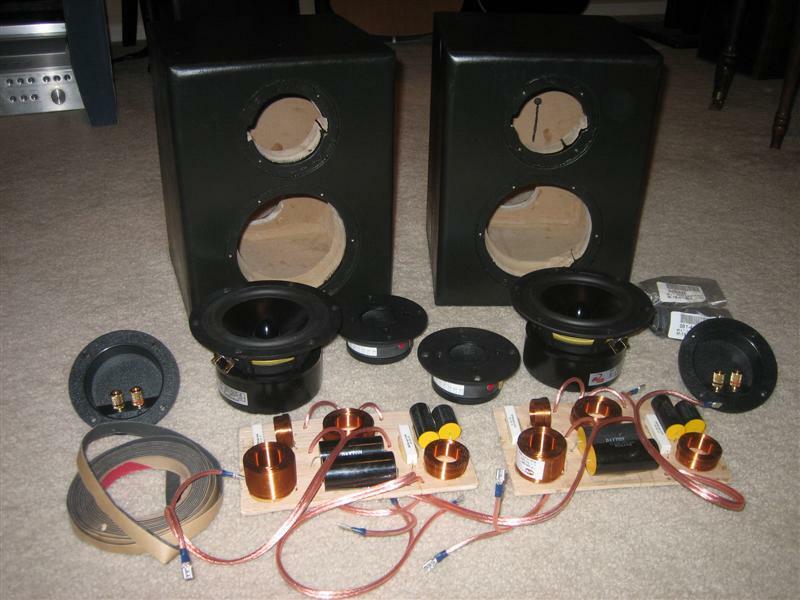 Then when it came down to actually buying the parts, I ended up just buying all the crossover parts for the Encores, since it was cheaper than trying to buy both, it accounted for baffle step compensation (mine didn’t) and it’s basically a proven design, even if only in one other speaker system. 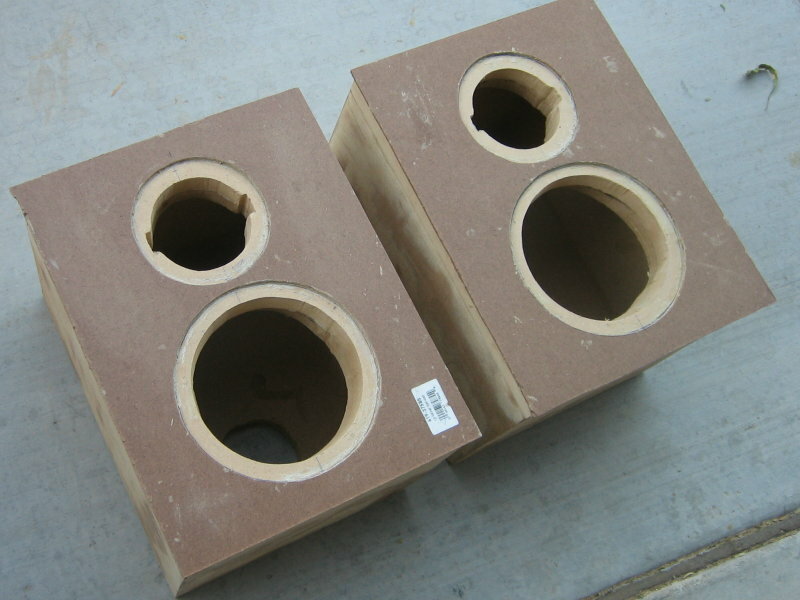 So what was once going to be a killer two-way speaker that I designed, turned into just a remake of these great Encore speakers. Which is fine with me, it’s only a slight hit to my speaker-building ego. They look great, though my typical paint job is pretty lousy. I think black paint is the hardest color to paint. Fortunately they sound a lot better than look. (Except for the drivers, they alone do look amazing). I do plan to change up the box a bit and do a 4th order vented enclosure as soon as I get around to buying some new ports from PE. The total net volume is about 8L which is a bit small for a ported box and this 6″ driver, but it models well, slight 2 dB hump, and should give me some extra extension over the same volume sealed box. But for now, they are sealed and filled 100% with polyfil. They certainly need a sub to hit any of the low notes at all. But the bass isn’t bad considering the size. The match to my center channel is just a little bit off. I want to redo the crossover in my center channel, it’s a bit too bright for the mains. The last time I did a sweep on the center channel with REW, the response was somewhat erratic and showed a gradual rise from just a few hundred Hz up to 20 kHz. 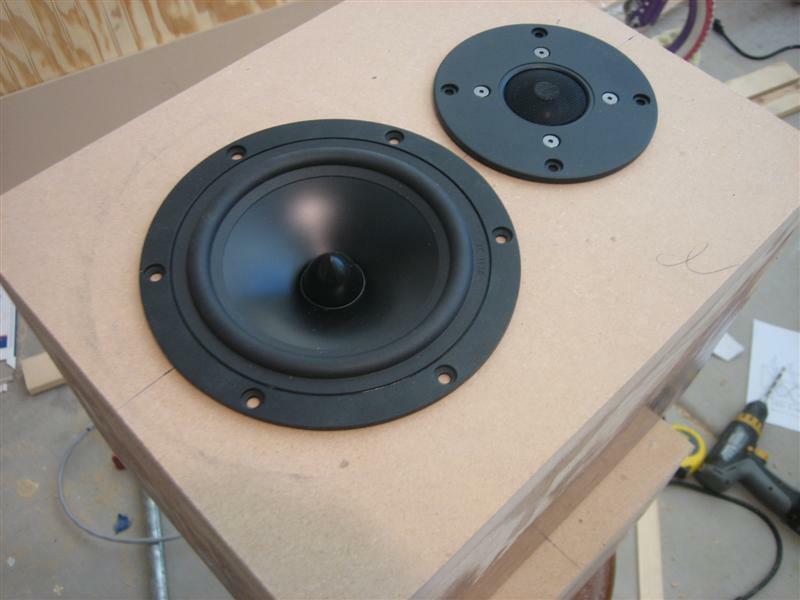 I would like to rebuild the center with the same drivers, but part of me just hates to tear apart a perfectly good speaker, just for the sonic aesthetics of having the exact same sound coming from the three front speakers. They sound close enough now, and with a slight tweak on the center’s crossover, I think I can get them to all sound similar enough to be satisfying. We watched a movie last night and my wife thought everything sounded great. Which I don’t disagree, the whole setup does sound great, but the match to the center needs to be better. Today I popped on a little Harry Connick Jr. for just some 2-channel listening and was completely blown away. The detail and clarity were astonishing. Harry’s voice sounded deep and rich, the piano sounded true, the high-hat was crisp, the sax so breathy and the big band brass just filled the living room. I couldn’t believe such impressive and filling sound could come from such little speakers. I am ecstatic with their performance. 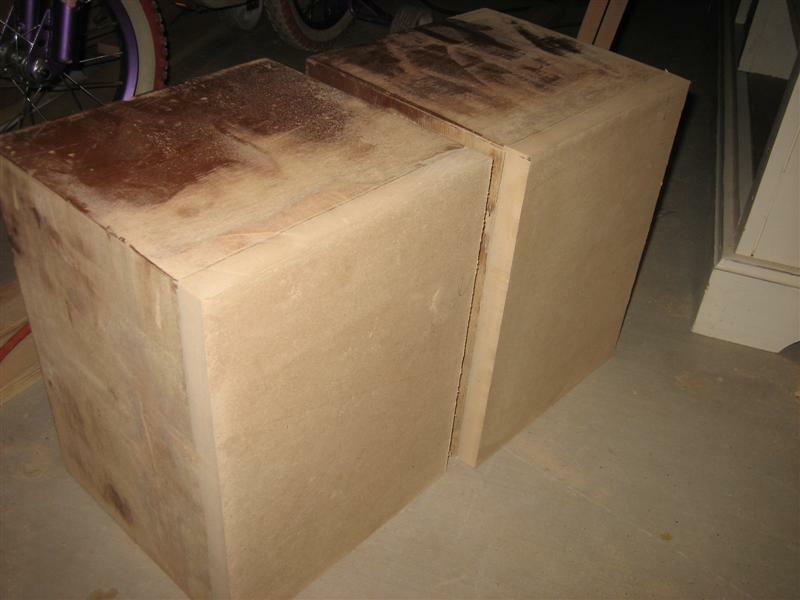 Check out some of the pictures below to see just how I took an old pair of bookshelf speakers and made them brand new again. Just wanted to say thanks to Darren for the great crossover design! The speakers sound awesome. And thanks to Parts Express for their exceptional products and continued support for the DIY community. 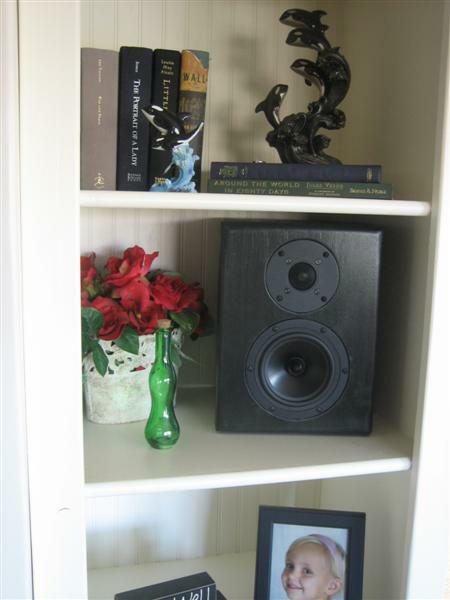 I definitely recommend this speaker project to anyone looking for a great HT/music bookshelf speaker that offers exceptional sound in a compact and affordable package. 095-280 – 1/4″ (16-14) Female Disconnect 50 Pcs. Click on the thumbnails below for full-res pictures of the complete makeover. So it’s been about a year since I finished these speakers and after listening to countless CDs and watching a bunch of movies, I decided that, although these speakers sound great, they were a little too laid back for my liking. The highs were a little too soft, too muted, too mellow. I like something a little brighter, with a little more presence in the upper region. 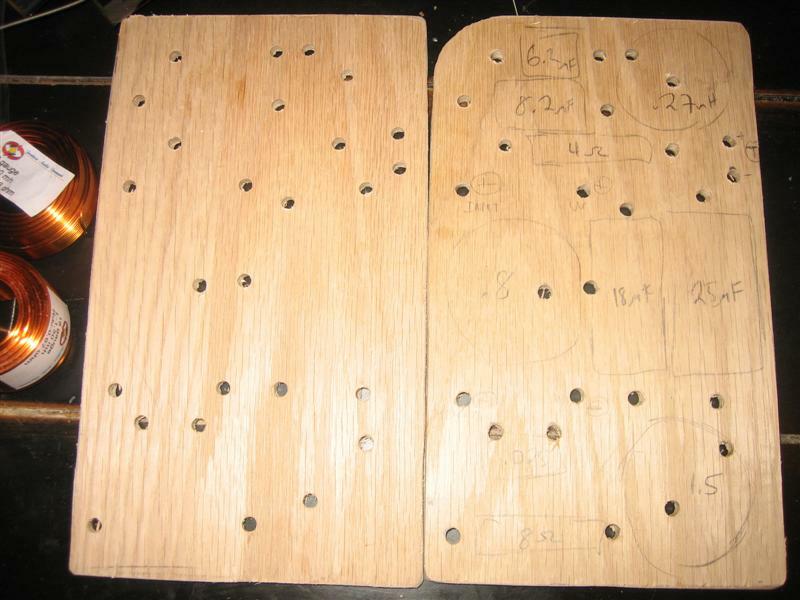 I figured this is due mostly to the full baffle step compensation in the crossover compounded with the fact that these are sitting on a bookshelf where the full baffle step is mostly already taken care of, so the need for compensation just wasn’t there in my application. It gave the speakers too much low end. Problem is I’ve got a subwoofer with this setup so having more low end from a 6″ woofer in when you’ve already got a 12″ woofer just made for a muggy, tonally imbalanced sound. I could never get the guitars and the symbols of the drums to have enough volume, enough crash, enough dynamic. Everything else drown it out. I compensated with EQ over the year, but it was time to fix it for good. I modeled the crossover in PCD (Passive Crossover Designer) and by keeping the exact same components, or by adding very little, I wanted to see if I could remove the baffle step and increase the level to the tweeter, without having to buy a bunch of new parts, and this is what I came up with. I bypassed both shunt inductors on the woofer, so I end up with a very basic 2nd order 12 dB/octave low pass with a Zobel network following it. Nothing fancy, and no more baffle step. Now to bring the level of tweeter back up I dropped the 4 ohm resistor to a 2 ohm resistor and removed the 8.2uF cap again making it a simple 2nd order filter. These new values modeled up very nicely and gave me a nice flat response over the entire band of the speaker. I changed the crossover in just one speakers and did an AB comparison of the old and new crossover and gave both a good listen. The crossover did exactly what I was hoping, it brought the high-end out of the dark ages and into my living room. 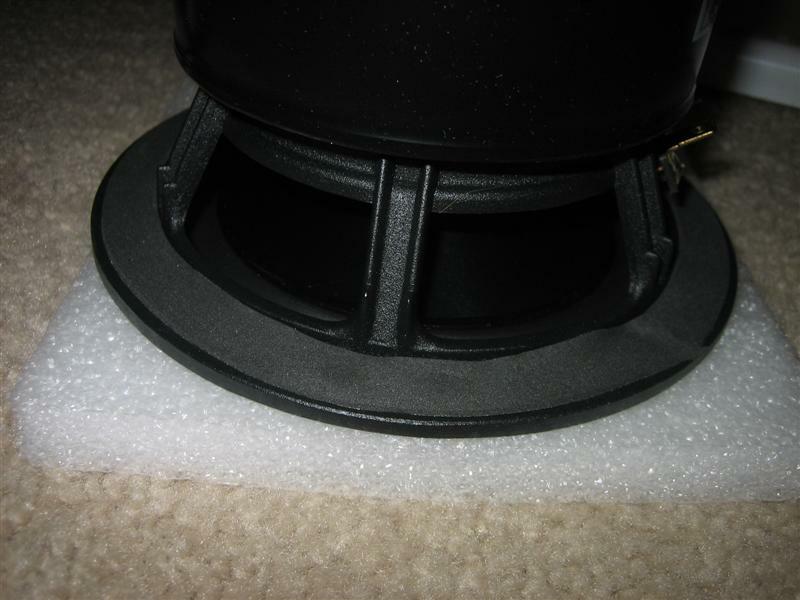 The original crossover sounded like there was a pillow in front of the speaker compared to the new crossover. Vocals sounded cleaner and more intelligible and music overall had more presence, more sound, more highs, and just sounded, to me, much better. 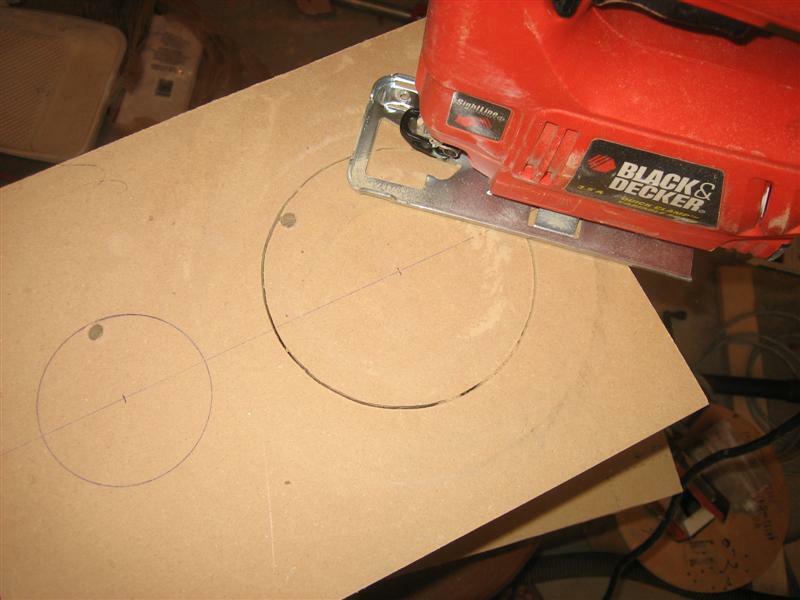 Acoustically they just sound “flatter” to me now. I suppose it was my own fault for adding full baffle step to a speaker and then putting it into a bookcase and adding a sub. 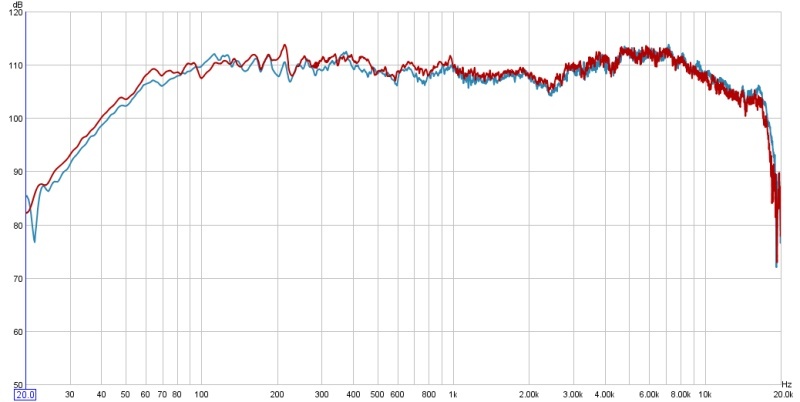 I measured the new response with Room EQ Wizard and my ECM8000 instrument mic and they have a very nice flat response when measured in my listening room while doing both near-field and far-field measurements. So I’m pretty happy with the new sound. We watched Transformers II the other night, right after I finished putting them all back together, and the movie sounded awesome. That movie has a great LFE track, too much bass to even handle. My whole house was just shaking the whole time. 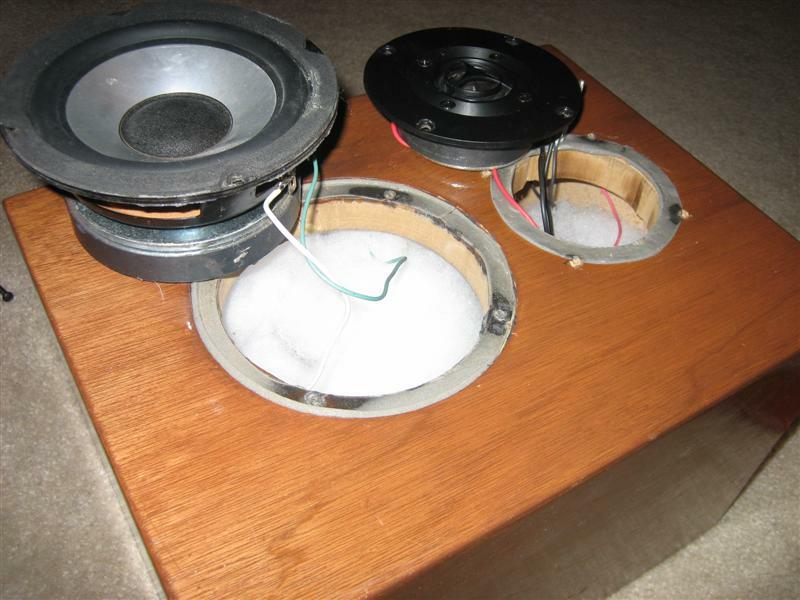 But the effects coming out of these speakers is much more pronounced and more believable. You actually feel like your there just a little bit more than before. Not to mention playing music sounds better too, just a bit more high end and less bass from such a small speaker. 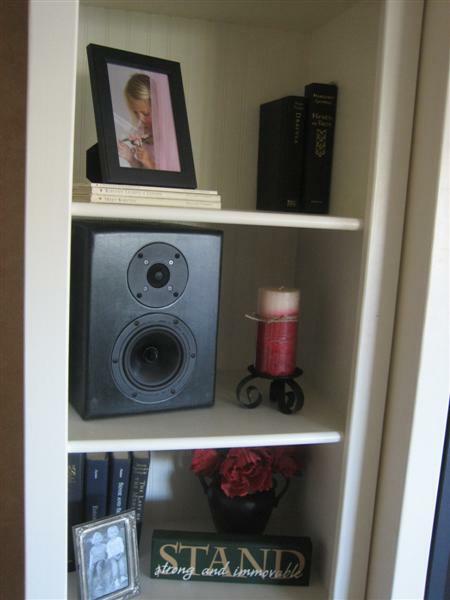 This entry was posted in Audio/Video and tagged bookshelf, dayton, encore, parts express, reference, speaker. Bookmark the permalink.